There has been progress toward our organizational goals but we are still developing indicators to measure that progress. See our comprehensive "Feasibility Study" and pilot project updates on our website, www.nonviolentpeaceforce.org. Problems common to new organizations, such as difficulty acquiring funding and lack of staff, have been the most significant obstacles but we are working to identify and overcome such problems as we build and gain experience with this new organization. Lack of mainstream media coverage is another obstacle to promoting the culture of peace and nonviolence. When we do succeed in communicating with individuals and groups who have not previously investigated the nonviolent option, the response has been uniformly enthusiastic. 1. The founding of the organization itself, which originated at the 1999 The Hague Appeal for Peace Conference. 3. The Nonviolent Peaceforce Inaugural Convention held in November-December 2002 in Surajkund, India, and attended by over 130 people, representing nearly 40 organizations, from every part of the globe. 4. The development of a core training curriculum for nonviolent intervenors by an international consortium of experienced trainers--the curriculum may be purchased from Training for Change--www.trainingforchange.org. 5. 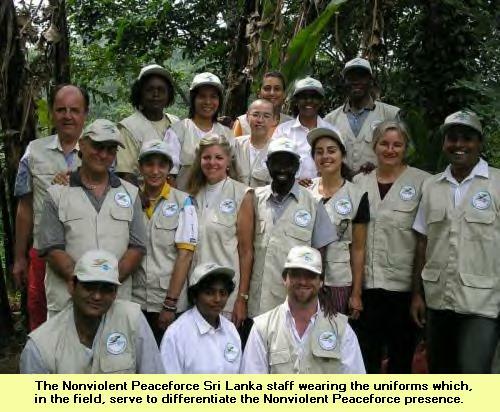 The initiation of the Nonviolent Peaceforce pilot project in Sri Lanka in the latter half of 2003. The project has just noted its first anniversary and is expanding to bring more teams of multinational, trained nonviolent intervenors to Sri Lanka to work with local peacekeepers and peace makers. Visit our website for updates and information about applying to become one of our field team members in Sri Lanka. Use the upcoming Global Partnership for the Prevention of Armed Conflict (at the UN, July 2005) as a platform to create political will among governments world wide to support, with finances and expertise, a stronger role for NGOs and CSOs committed to nonviolent prevention, intervention and reconciliation of armed conflicts. Nonviolent Peaceforce itself is organized through a network of 93 member organizations located around the world. These organizations are international (e.g., International Fellowship of Reconciliation), regional (e.g., West Africa Network for Peacekeeping), national (e.g., Women Making Peace [Korea]) and local (e.g., SERPAJ-Morelos [Morelos, Mexico]). Exploratory visits to areas of conflict (Mindanao, Philippines; northern Uganda-southern Sudan; etc.) will prepare for additional Nonviolent Peaceforce projects and deployments in the second half of the Decade. At the same time, regional training in nonviolent intervention techniques and strategies along with a public education campaign will spread the notion of nonviolent alternatives to violent conflict.